Invitae is shaking up how the genetic testing industry operates -- and that has already caused trouble for Myriad Genetics. When it rains, it pours. That's especially true for investors of genetic-testing leader Myriad Genetics (NASDAQ:MYGN), who have had to stomach year-to-date losses of 51%. Much of the decline was catalyzed by the company's fiscal fourth-quarter 2016 results. While two new tests continued to show promising growth, sales of the company's flagship revenue generator contracted by 7% quarter over quarter thanks to increasing competition. Unfortunately, this may not be a short-term concern. In 2016, after years of advances in genomics and diagnostics, competition is coming from more unusual sources than in years past. Chief among the antagonists is Invitae (NYSE:NVTA), a tiny $240 million company that posted just $5.6 million in revenue in the most recent quarter. Considering the $186 million in quarterly sales Myriad Genetics raked in, you may be inclined to think Wall Street is overreacting to the potential threat posed by Invitae. But you should think twice before overlooking the tiny competitor. The newcomer's business model centers around providing affordable, high-quality genetic tests for a wide variety of diseases directly to doctors. It may not sound that impressive, but it's quite disruptive to the business models of pioneers like Myriad Genetics, which built moats around exclusivity and high barriers to entry. But the advantages of first-movers are no longer as insurmountable. While we have a long (long) way to go, we're getting a better grip on the complexities of biology, especially when it comes to detecting the presence of particular genes. Falling costs, which are good news for patients and doctors, are horrible news for Myriad Genetics, which is heavily dependent on monopoly pricing for a single test -- BRACAnalysis, a hereditary test for breast and ovarian cancer. It generated nearly 90% of the company's total revenue in fiscal year 2016. Investors heard the first warning shots in April 2016. That's when Invitae CEO Randy Scott took a direct shot at Myriad Genetics, saying, "There is no reason payers should be spending multiple thousands of dollars on genetic tests or paying for code stacking due to serial testing of multiple genes." The term "code stacking" refers to the practice of charging full price for each gene analyzed in a single test. For instance, if one dozen genes are analyzed in a single assay, then a company that relies on code stacking to boost sales would have a single billable code for each gene. Invitae has lowered costs for doctors and patients by avoiding this practice, and it has lowered costs for each test shipped by relying on novel assays and modern analysis techniques. Of course, the real reason for that April press release should be no less intimidating to the competition: Invitae announced that a Medicare contractor had priced the company's genetic test for genes associated with breast and ovarian cancer at $622.53 -- just 28% of the cost of BRACAnalysis. That same Medicare contractor works with -- you guessed it -- Myriad Genetics. Fears of lower-priced competition heightened in the most recent quarter as year-over-year BRACAnalysis revenue fell 7% for the quarter and 1% for the full year. Investors abruptly went into panic mode. The good news is that Myriad Genetics has two fast-growing genetic tests on the market that may help to insulate it from competition to BRACAnalysis. Vectra DA, a blood test used to determine the risks of future joint pain in patients with rheumatoid arthritis, and Prolaris, a test for scoring the severity of prostate cancer tumors, grew revenue from a combined $45.8 million in 2015 to $59.1 million in 2016 -- a jump of 29%. While dwarfed by the importance of the flagship product, the two growth products did mitigate declines in BRACAnalysis enough to allow Myriad Genetics to post 2% growth in total sales for 2016. Then again, that good news doesn't negate Invitae's powerful momentum. In the first quarter of 2014, the tiny company billed about 200 genetic tests for $118,000 in revenue. By the second quarter of 2016 those numbers swelled to 12,100 billable genetic tests and $5.6 million in quarterly revenue. The company's cost of goods has fallen from $1,250 per sample at the beginning of 2015 to just $500 per sample in the most recent quarter. The company is still losing significant amounts of money each quarter -- it posted losses of about $24 million in each of the last five quarters -- as it plows cash into growth, which means it needs to raise more capital through debt or shares in the near future. But the hockey-stick growth is likely to continue for the foreseeable future thanks to its elegant business model, lineup of offerings, and distaste for the code-stacking practices of other companies. Wall Street is no stranger to overreaction. The smallest short-term developments can have a huge impact on a company's shares. 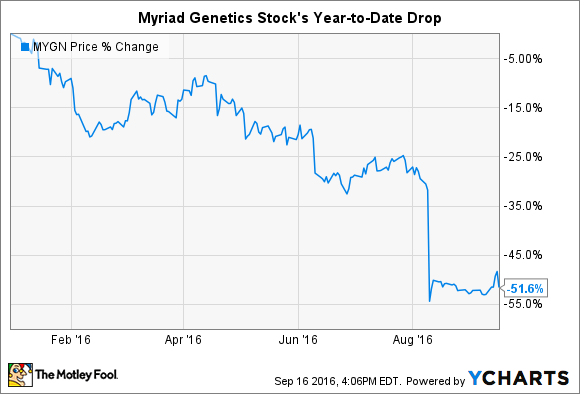 This time, however, Myriad Genetics investors should be a little more cautious. More and more patients are inquiring and demanding genetic tests, and more and more doctors are choosing high-quality tests billed at affordable rates. Myriad Genetics is no longer the default answer. Right now, tiny Invitae seems better positioned to capitalize on the growing demand for genetic tests than its bigger, better-known competitor.